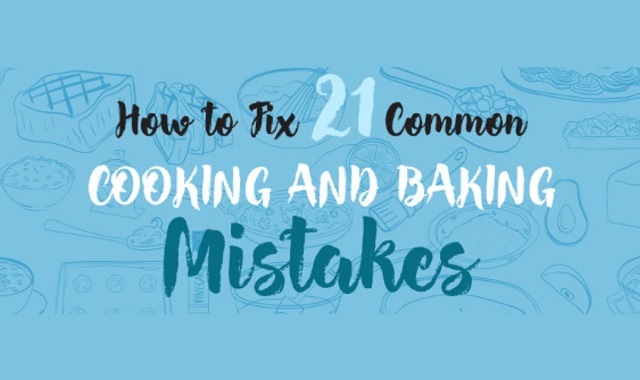 How to Fix 21 Common Cooking and Baking Mistakes #infographic ~ Visualistan '+g+"
Whether you are just getting started in the kitchen with cooking and baking, or you are a seasoned chef, mistakes happen to the best of us! This infographic from TitleMax.com provides expert tips for fixing and preventing common cooking and baking mishaps, such as creating a dish that is too salty, rubbery hard-boiled eggs, dry cake, uneven baking, hard cookies, and much more. By adding these food hacks into your arsenal of knowledge and skills, you save valuable time and sanity by salvaging a too-spicy dinner or revitalizing your cracked layer cake. Not only that, these tips can help you prevent stressful and disappointing disasters like cookies spreading too much, bread baking evenly, firm and chewy dough, clumpy chocolate, soggy pasta, cracked or dry cake, and more. After all, according to Benjamin Franklin, “an ounce of prevention is worth a pound of cure”. Cooking is all about fun and experimentation, and this quick reference guide can help you enjoy cooking without discouraging blunders.